Multiple published reports this week say that David Stemme will be out of the Penske Racing #12 Dodge next season, replaced by Brad Keselowski. While none of the involved parties are commenting at present, sources close to the situation say that intense negotiations late last week finalized a deal to bring Keselowski to the Penske camp with a multi-year contract. Keselowski was on the Sprint Cup radar long before an upset victory in James Finch’s Phoenix Racing machine at Talladega earlier this season. In fact, he declined an identical offer from Penske a year ago, holding out for a spot in the potent Hendrick Motorsports stable. Less than a year ago, team owner Rick Hendrick called the Michigan native “the future of Hendrick Motorsports,” but unfortunately, the future was all he could offer. All four HMS Chevrolets are presently filled with top-notch talent, and until Mark Martin finally calls it a career (or Jeff Gordon’s ailing spine forces him into retirement), there is simply no room at the inn. And so, the driver who once seemed destined to steer a Hendrick Motorsports Chevrolet finds himself just weeks away from a Penske Racing Dodge. What a strange, strange world. It’s been a long and surprisingly difficult trek for Keselowski. At different points in the process, he has been linked with Hendrick Motorsports, Stewart-Haas Racing, a proposed JR Motorsports Sprint Cup team, Penske Racing, Phoenix Racing and others. In the end, however, every option but one came up empty. Hendrick ran out of room when Mark Martin said he’d like to run another season. Or two. 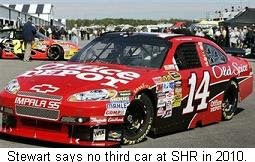 Tony Stewart said Stewart-Haas was not yet ready to add a third car. Dale Earnhardt, Jr., declined to take his team to the Cup series, citing sponsorship concerns. And Finch – even with promised technical support from Hendrick – has never ranked among the circuit’s elite teams. Eventually, it became clear that Keselowski’s only real option for 2010 was Penske Racing, which rewarded Stremme for yeoman work as a test driver a year ago, only to watch the Indiana native struggle in his first season in NASCAR’s new racers. 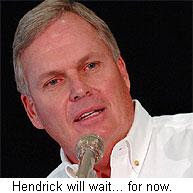 Even Hendrick sounded resigned to the deal this weekend at Bristol Motor Speedway, saying, "I won't lose him forever. Hendrick has good reason to be graceful. As the unquestioned lead dog among NASCAR Sprint Cup team owners, he understands that he can ultimately have any driver he covets. Everyone’s contract expires eventually, and nobody says “no” to a job offer from Mister H. He’ll get another shot at Keselowski one day, and he knows it. Hendrick even left the door open for Keselowski to continue driving the JR Motorsports Nationwide Series Chevrolet next season, though the chances of that happening are miniscule. 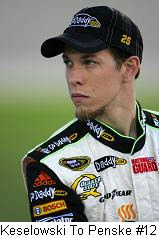 Kelley Earnhardt Elledge told ESPN's Marty Smith recently that there is no way Keselowski could continue with JR Motorsports after signing a Cup deal with a rival manufacturer. In fact, sources tell Sirius Speedway today that Kelly Bires is at the top of Earnhardt Elledge’s list of drivers to replace Keselowski when the Penske deal is announced. Once, a Hendrick-Keselowski partnership seemed to be written in the stars. But in the end, the deal fell victim to a simple case of bad timing. Too many drivers, not enough rides. Roger Penske has snapped up one of the most talented newcomers in recent memory, and if all goes well, the deal may go down as the biggest swipe-job since Hendrick himself lured Kyle Busch away from Roush Racing. And if not, Mister H will be waiting. After all, good things come to those who wait. Patrick To Stay In IndyCar: OK, we can all stop talking about Danica Patrick now. Patrick finally admitted Saturday that she and “her brand” will remain in the Indy Racing League, with Andretti Green Racing. "Every team has its pitfalls and people who are difficult, but I like some of the changes being made for this team (that are) good for me," said Patrick. “This is a great team. It's won a lot of races and there's no reason to think we can't do it again. My deal isn't finalized, but things are going well and clearly moving forward and that's good." Questioned on her on-again, off-again flirtation with NASCAR, Patrick said, "I think at the end of the day, the devil you know is better than the devil you don't know." Ambrose's Deal Nothing To Sneeze At: JTG Daugherty Racing has announced that Kimberly-Clark’s Kleenex brand will serve as a sponsor on Marcos Ambrose’s #47 NASCAR Sprint Cup Series Toyota in 2010, beginning with the season-opening Daytona 500 in February. Kleenex will serve as primary sponsor in five races (including Daytona) and as an associate backer in the other 31 events. They have been a major sponsor in the NASCAR Nationwide Series for the past 15 years, most recently with Baker-Curb Racing and driver Jason Keller. Ambrose is currently 17th in Sprint Cup points in his first full season of competition, finishing third behind winner Kyle Busch and runnerup Mark Martin at Bristol Motor Speedway Saturday night. Elliott Sadler is downplaying a published report that he will jump from Richard Petty Motorsports to Richard Childress Racing next season, replacing Casey Mears in the #07 Chevrolet. While Childress and the Emporia, Va., driver do speak from time to time, it’s generally about hunting, not racing. 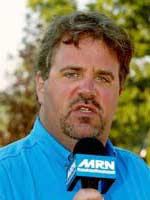 And well-placed sources at sources at RCR tell Sirius Speedway that there have been no talks about bringing Sadler to the team in 2010. Testing, Testing, 1-2-3: NASCAR took 11 engines to its Research and Development Center in Concord, N.C. for analysis following yesterday’s race at Michigan International Speedway; part of an ongoing series of tests to monitor the horsepower and torque being produced by the various teams and manufacturers. NASCAR will test the engines of Chevrolet’s Jeff Gordon, Tony Stewart, Clint Bowyer and Juan Pablo Montoya, Toyota’s Brian Vickers, David Reutimann and Denny Hamlin, Ford drivers Carl Edwards, and Greg Biffle, and Dodge’s Sam Hornish Jr. and Elliott Sadler. Accavitti Pledges Support: Dodge CEO Mike Accavitti said this weekend that the automaker remains committed to NASCAR, and will remain involved in the sport even if it loses Richard Petty Motorsports to Toyota. 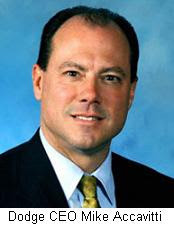 Sunday at Michigan International Speedway, Accavitti called Dodge’s involvement in NASCAR “a match made in heaven." He refused to speculate on the future of Richard Petty Motorsports, which continues to negotiate with both Dodge and Toyota about the 2010 season. He did say, however, that the team has been paid everything it is owed, erasing some past-due bills resulting from the automaker’s recent bankruptcy filing. He also confirmed that the Dodge could remain in the Sprint Cup Series with only the three Penske Racing teams, if necessary. In his words, "You really only need a couple of good cars." More Jerry Springer, Coming Right Up: After a two weeks of relative calm on the Jeremy Mayfield front, Catawba, NC, police officials now confirm that they were called to Mayfield's home Saturday to answer a trespassing complaint that involved Mayfield’s former stepmother, Lisa Mayfield. Jeremy Mayfield phoned police Saturday, alleging that Lisa Mayfield was drunk, banging on his door and threatening to kill him. Lisa Mayfield testified recently that she witnessed her former stepson snorting methamphetamine on numerous occasions, then sued him for slander after he called her a whore and a gold-digger. Mayfield has promised to file a wrongful death lawsuit against her, saying he believes she played a role in the 2007 death of his father; a death that was officially ruled a suicide. Phoenix Sets NNS Lineup: Phoenix Racing Team Manager Marc Reno, said Friday that Sprint Cup drivers Ryan Newman, Reed Sorenson, Max Papis and Martin Truex Jr will drive the team’s #1 NASCAR Nationwide Series Chevrolet, replacing the recently fired Mike Bliss. Sorenson will reportedly steer the car at Michigan and Bristol, with Papis running the road course in Montreal, Newman driving at Atlanta, and Truex Jr. at the controls at both Richmond and Dover. 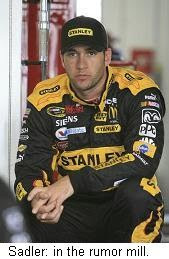 Ironically, Bliss drove the Phoenix Racing #09 Sprint Cup entry Sunday at Michigan, finishing 38th. Robby Gordon’s car owner needs to have a long talk with his driver. Saturday at Watkins Glen International, the Peck’s Bad Boy of NASCAR lost his legendary temper for the second time in as many weeks, retaliating for some perceived slight by pushing Joey Logano’s GameStop Toyota into a tire barrier at high speed, after the caution flag had flown for an unrelated incident. The crash caused Logano’s car to erupt in flames, and triggered a series of angry comments from the normally low-key driver after the incident. “I guess he was upset because this is one of the two tracks he thinks he has a chance on,” said Logano. "It's a pretty raw deal. You can't fix stupid. It's forever. But you put that in your memory bank." Gordon had little to say immediately following the race. The next morning, however, he sought-out NASCAR officials to explain his side of the story, and even issued a press release on the topic. “(The) whole turn of events started with Joey running into the back of my #55 in Turn 10,” said Gordon. “He then knocked me sideways in Turn 11. To show him my displeasure, I ran him down toward the inside wall on the front straight. I tried to do a crossover move in Turn One to get back by him. However, I misjudged a little, resulting in both of us getting flat tires. Saturday’s incident was not the first involving Gordon this season. Just seven days earlier at Pocono Raceway, Gordon and driver David Stremme were penalized five laps apiece for multiple bumping incidents, culminating when Stremme spun Gordon on the Long Pond straightaway. 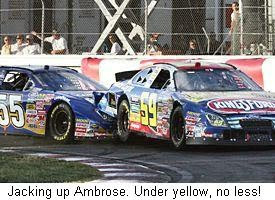 Prior to the crash, Gordon announced on his in-car radio that he would intentionally wreck Stremme, and didn’t care what NASCAR did about it. Gordon’s most notable outbreak of bad behavior came in 2007, when he wrecked leader Marcos Ambrose late in a Nationwide Series race in Montreal, refused to forfeit his position when ordered to by NASCAR, ignored multiple black flags, then cut a series of victory donuts following the race. His actions earned him a suspension from the next day’s Sprint Cup race at Pocono. 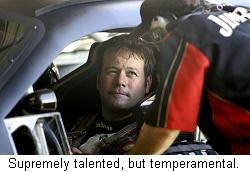 There is a lot to like about Robby Gordon. He is one of NASCAR’s last true owner-drivers, going it alone in a sport dominated by multi-car teams and multi-million dollar alliances. His talents at the wheel of a racecar are beyond dispute, and he appears on virtually everyone’s list of potential winners when the Sprint Cup Series stops at either Infineon Raceway or Watkins Glen. Unfortunately, the same maverick mentality that makes Gordon so unique in the garage sometimes makes him a hazard on the racetrack. Unfortunately, Robby’s fuse has become dangerously short, and it’s time for NASCAR to dampen his powder. Sprint Cup Series Director John Darby said no decision had been made about penalizing Gordon for his actions Saturday, adding that Robby's behavior in Monday's rain-delayed Cup race would play a role in his decision on whether (and how hard) to drop the punitive hammer. Gordon raced like a choirboy Monday, minding his manners en route to an 18th place finish. Historically, NASCAR has done a good job of policing situation like these privately, with unscheduled “Come To Jesus” meetings behind the offending driver’s transporter. If such a meeting hasn’t already taken place, it should. One of NASCAR’s most talented drivers is rapidly becoming one of its most dangerous, and that trend cannot be allowed to continue. Multiple sources at Richard Petty Motorsports tell Sirius Speedway that RPM is still mulling the possibility of moving its entire operation to the Toyota camp in 2010. RPM spokesmen have downplayed reports of a possible manufacturer switch in recent weeks, but sources say that talks are ongoing with both Dodge and Toyota. No decisions have been made, but in an attempt to cover all their bases, the team recently had a series of publicity photos taken of Kasey Kahne and a Budweiser-sponsored #9 Toyota Camry. Red Bull To Stay Put: Published reports today say that Red Bull Racing will remain in the Toyota camp for 2010 and beyond. General Manager Jay Frye traveled to Austria recently to meet with team owner Dietrich Mateschitz and choose between Toyota and Chevrolet, and to solidify the status of Brian Vickers, who is in the final year of his current contract. Frye told Sirius Speedway last week that an official announcement will be made in the next 7-10 days, and sources close to the team say that Toyota will get the nod. Vickers will return to the team with a new multi-year contract, and will also run a limited schedule of NASCAR Nationwide Series races next season with Braun Racing. New Bullet For FoMoCo: Ford Motor Company will debut its new NASCAR powerplant this weekend at Michigan International Speedway. The engine features improved horsepower and torque curves, as well as an improved cooling system, allowing teams to run more tape on the nose to improve downforce. No specifics have been announced yet, but at least some of the five Roush-Fenway Racing Fords are expected to run the new engine Sunday. Tony Stewart said yesterday that he doubts Stewart-Haas Racing will expand to three-car operation in time for the 2010 season. With both Stewart and teammate Ryan Newman solidly among the Sprint Cup Series’ Top-12, speculation is rampant that a third car could be added in time for next season. Both Brad Keselowski and Kevin Harvick are rumored to be talking with Stewart-Haas about steering the team’s third Chevrolet next year, but Stewart said Tuesday that it’s too late to begin putting a third entry together for 2010. Hamlin Mea Culpa: Denny Hamlin admitted yesterday that he wrecked David Reutimann at Pocono, and said he wants to find a way to atone for his mistake. Hamlin turned Reutimann around late in Monday’s race, triggering a wreck that also swept up Reutimann’s Michael Waltrip Racing teammate, Marcos Ambrose. It turned a sure Top-10 finish -- Reutimann was eighth at the time of the crash –- into a disappointing 29th-place showing, and badly damaged Reutimann’s bid to make the Chase for the Championship. He entered Pocono just 68 points out of the Top-12, but now is sixteenth in the standings, 121 points out. Reutimann has taken the high road since Monday’s incident, bemoaning the crash and its impact on his championship hopes, but refusing to criticize Hamlin. No Camaro In Nationwide: Fans hoping that General Motors would follow the example set by Ford Motor Company and enter the new Camaro in competition on the 2010 NASCAR Nationwide Series had their hopes dashed today by news that the automaker will forge ahead with plans to campaign the Chevy Impala. Dodge and Ford will race the Challenger and Mustang, respectively, while Toyota has yet to officially announce its new Nationwide Series nameplate.